Walt Whitman Birthplace Association celebrates poet Anne Bradstreet (1612-1672), the first female poet published in Britain and America. Anne Bradstreet was born into a prominent family. She was the daughter of Thomas Dudley (a cofounder of Harvard). Anne was raised in a culturally rich environment and was a well-educated woman of her time and was tutored in history, language and literature. Bradstreet immigrated to the British colonies, specifically Massachusetts, in 1630 with her husband Simon Bradstreet. 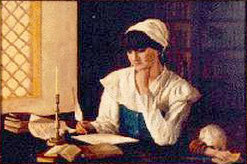 Anne Bradstreet’s education gave her a foundation to write with authority about politics, history, medicine and religion. It is estimated that her personal library held over 800 books. The book would be Bradstreet’s only work published during her lifetime. Anne was forced to pretend she had no knowledge of the book’s publication, as it was unacceptable and “unwomanly” for her to aspire to be an author. Anne has since been recognized as a free thinker who placed value in the pursuit of knowledge and intellect, and has even been considered an early feminist by some. Her book received positive reception from readers in both England and the colonies in America. While Anne was an early pioneer of literature and free speech for females to come around the world, her achievements are only commemorated by two places in America. First, in the North Andover cemetery, the town where Anne was believed to been laid to rest in Massachusetts, a marker was dedicated in 2000 to celebrate the 350th Anniversary of the publishing of “The Tenth Muse.” Additionally, at Harvard, where in October 1997, the Harvard community dedicated a gate honoring Anne Bradstreet as America’s first published poet. It has come to be known as The Bradstreet Gate and is located on the campus next to Canaday Hall. The Walt Whitman Birthplace Association would like to hope that this page will be another place to commemorate Anne’s achievements not only for poetry, but for women. Anne’s efforts continue to influence women’s freedoms in literature and society.